What if there was a way of knowing our moments more richly and more deeply as they unfold? What if we experienced more memorable moments in any given day? How might this alter the experience of our lives? 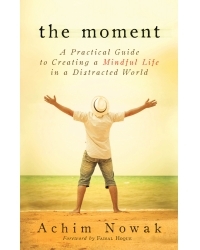 That is the tantalizing premise of Achim Nowak’s book, THE MOMENT. It introduces us to 4 simple keys. These keys are entirely common-sense. That is their beauty. Return to experiencing the world with all of your senses. Learn how to tune into prajna wisdom – the wisdom that talks to us as a moment unfolds. Discover ways of receiving and wave-riding energy. And reap the rewards of making time stand still. THE MOMENT is a compulsively readable book. Instead of urging us to do more and work harder, THE MOMENT shows us how to rediscover a childlike delight in the world. Apply the 4 keys, and sumptuous moments will suddenly pop up all around you. You will instantly experience more success in business and in life. You will know the infinite pleasures of living in the moment. Achim Nowak is an international authority on presence and interpersonal connection. His first two books—Infectious and Power Speaking—have become essential leadership development tools with Fortune 500 executives and entrepreneurs. Achim’s work integrates a wealth of experience in the personal transformation field, actor training, conflict resolution, and spiritual practice. He has been featured on 60 Minutes, NPR, Fox News, and in the Miami Herald. His weekly Energy Boost message offers practical tools for creating an energized life and has a devoted following across the globe. Achim lives in Miami, Florida.